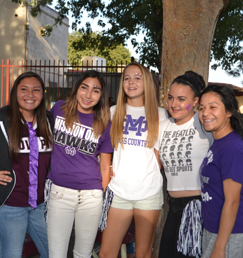 At Mission Oak, the Hawks REIGN. Our school is in our second year of our successful launch of REIGN - our way of practicing Positive Behavior Interventions and Supports (PBIS) on our campus. PBIS is a nationally recognized initiative to bring a positive change to school climate, including the way students interact with each other, their teachers, and their campus. Our team of teachers, administrators, classified staff members, and students selected REIGN as our behavioral expectations. We recognize students when they are seen practicing positive behaviors on campus. 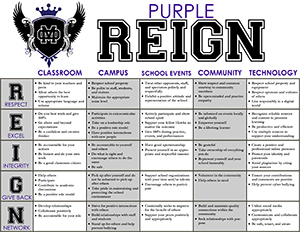 Any staff or faculty member can give a student a REIGN ticket, which the student can then turn in to the office for a prize. We hold the REIGN prize drawing at least quarterly, and students can win different prizes like gift cards and even a new TV or headphones. While the awesome prizes help motivate the students even more, it is the recognition of positive behavior that encourages students to help make a positive campus climate change. 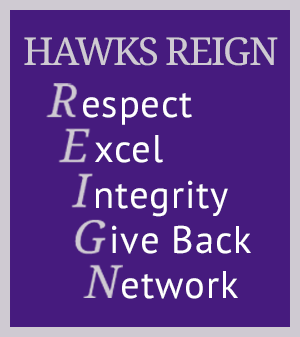 When students have collected REIGN tickets and received stamps in their Hawk Pass for five different elements of REIGN, they can receive additional incentives such as an early release from class or an off-campus lunch pass. Students who earn stamps for at least 10 different elements of REIGN will receive a pin to wear at graduation. Twenty elements of REIGN earn the student a medal to wear at graduation. Receiving a stamp for all 25 elements of REIGN grants the student the title of REIGNmaker and recognition at awards ceremonies and graduation along with other incentives. PBIS is certainly a campus-wide initiative that affects all students, but we gear our Tier II supports toward approximately 15% of the student population who need more one-on-one supports to improve their daily behavior. These students work closely with our counseling and administrative staff to find ways to bring success academically and socially. The teachers and counseling staff refer these students, but families also can request an assessment for services. Please use the online form below to request Tier II support for your student. The best way to measure the positive effect of REIGN on our campus is to watch the way our discipline data fluctuates throughout the year. We update the staff and teachers at least quarterly on our discipline data. Check back soon for an updated online version. If you have questions, concerns, or want to know how you can get more involved, let us know!